The other two commonly used materials are Nylon and Polyester. These are far more light weight than cotton and can also fold up very small, so are ideal for smaller tents, yet these can be extremely waterproof if treated properly. However, even these types of material do have their disadvantages, as they can become very brittle through constant exposure to ultraviolet light. Yet over the years, the technology has got a lot better to improve the life of your tent, and these days they are usually manufactures with a PU coating and many have a UV protection as well, which means that even if you are going camping in France or some other country that is prone to some very sudden changes in weather such as heavy downpours, then gorgeous sun, the tent will last far longer and be far more durable for lots more family camping holidays in France. 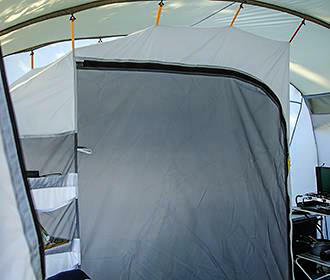 Lots of tents also have vents with a very fine mesh on them to protect you from bugs, but they also allow ample ventilation and these are, in our opinion, an essential part of any tent to maximise comfort whilst sleeping, especially on a hot summers night, plus they also help to minimise condensation. When you are looking at the type of tent you wish to purchase, there will be a waterproof rating, which is known as the hydrostatic head and this is basically the rain resistance rating, which is measured in millimetres to see how much water pressure it takes to penetrate the tent. You will see that some of the cheaper tents on the market only say around 1000mm hydrostatic head, or less, and a tent like this is really designed for summer camping and only light showers. But you can purchase tents with at least 2000mm to 3000mm hydrostatic head that are ideal for year round use and these are normally found on the more expensive or larger tents, yet there are ones that go up even higher for extreme conditions such as expeditions. 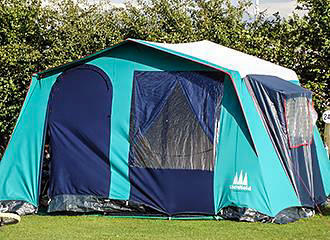 One point we would also like to make, is that many tents now have a built in groundsheet and these also have a waterproof rating, which normally starts at around 5000mm. So, in conclusion, the higher this number, means the more waterproof your tent is going to be, which will of course mean a far more pleasant camping holiday, especially when the weather can never be truly predicted! TIP: Even if there is a groundsheet, it also a good idea to have a tent footprint that will go down first and protect the main floor of the tent, especially from rips and holes made by stones etc. Therefore, this will extend the life of the tent and since you have the tent footprint laid out, it can also make erecting the tent easier. In the past, tents were often very heavy due to the materials used and most tent poles were steel, however, now-a-days you will find that most are made out of fibreglass, which are tough and sturdy, yet flexible and weigh far less than steel poles. However, they can become brittle and aluminium poles are a very good alternative and these are also used a lot on the new style caravan awnings. 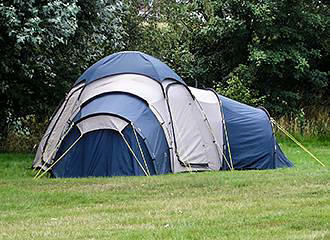 Fibre-glass poles are a very convenient way of putting up a tent, as they usually just unfold and link together via bungee cords inside, plus when you purchase a brand new tent they are normally colour coded for ease of putting together - We can assure you that colour coding is essential on many of the tents due to the number or poles required to erect it. TIP: A good option if your tent does not have colour coded poles..
Just get some different colours of electrical tape and using the diagram and instruction manual that comes with your tent, wind the electrical tape round each of the parts from left to right, so they all go into place exactly where they should. For instance, one line could be blue, the middle or central poles could be red, the front porch awning could be green and so on. 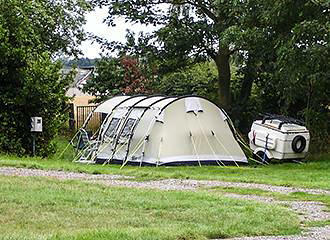 But if you can, put up your tent prior to going on holiday and make sure you have everything you need, all colour coded and all the correct poles - it will save a lot of time and hassle when you get to your destination, yet also stress if there is something missing, and we have heard of this on several occasions from tent poles through to caravan awning poles!! Guy ropes are also known as guy lines and these are used to provide your tent with added stability, which are ideal to secure the tent in place, especially if you are in windy conditions. These are found more frequently on small tents, and are ideal for making the tent sturdy and taught, but make sure you do not over pull on these as it will also weaken the points that could cause damage to the outer layer of the stitching making it less waterproof! The larger the tent, the less guy ropes are normally needed, but in most cases these cords will be supplied by the manufacturer at the time you purchase your tent, yet it is also an idea to have some spare cord with you as they can fray or become brittle over many times of use. Tent Styles - So what style of tent should you buy? Most tents will come with two layers, the outer layer, which is the part that is waterproof to hopefully keep you dry and the inner tent layer, which is normally for the sleeping compartment and/or living area. The added benefit of the two layers, is that it provides insulation and stops a lot of condensation from accumulating. 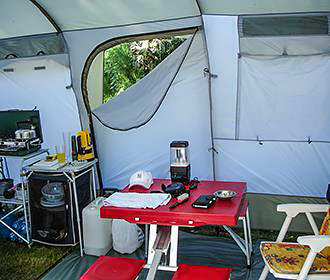 There are three main types of material that are used in tent manufacture..
Cotton is the traditional material used and is still often found on frame tents and this can also be known as canvas, plus cotton is utilised a lot for inner tents and sleeping compartments due to the fact that it allows the compartments to breathe and therefore will reduce condensation issues far more easily than some other materials, however, it is heavy, needs to be treated properly and takes longer to dry out, otherwise it can also rot very easily.